A 1,000-year-old perfectly preserved Viking sword has been discovered by archaeologists at the historic site of the former Beamish and Crawford brewery in Cork city. The wooden weaver’s sword is just over 30cm in length, made entirely from yew, and features carved human faces typical of the Ringerike style of Viking art, dating it roughly to the late 11th century. Consultant Archaeologist Dr Maurice Hurley said it was one of several artefacts of "exceptional significance" unearthed during recent excavations at the South Main Street site, along with intact ground plans of 19 Viking houses, remnants of central hearths and bedding material. "For a long time there was a belief that the strongest Viking influence was on Dublin and Waterford, but the full spectrum of evidence shows that Cork was in the same cultural sphere and that its development was very similar," he said. 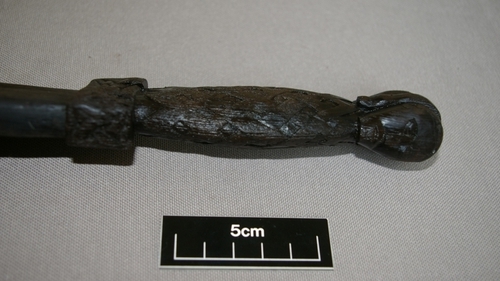 "A couple of objects similar to the weaver’s sword have been found in Wood Quay, but nothing of the quality of craftsmanship and preservation of this one," Dr Hurley said. He added that it was "quite miraculous" how the various wooden items had survived underground in such pristine condition. "The sword was used probably by women, to hammer threads into place on a loom; the pointed end is for picking up the threads for pattern-making. It’s highly decorated - the Vikings decorated every utilitarian object," he said. The Viking remains were found in May, but only came to light last Tuesday following an informal visit to the Cork Public Museum by the Norwegian Ambassador to Ireland, Else Berit Eikeland. "The visit did not coincide with any official or diplomatic event, but came about due to the Ambassador’s deep personal interest in the Vikings," said Museum Curator Daniel Breen said. Plans for a 6,000-seat multi-functional events centre at the site have been hampered by design changes, delays and massive financial overruns, with current estimates predicting the project could exceed €73 million.